North Carolinians like you are now using their cars and trucks to support our work and spread the word about the MST! 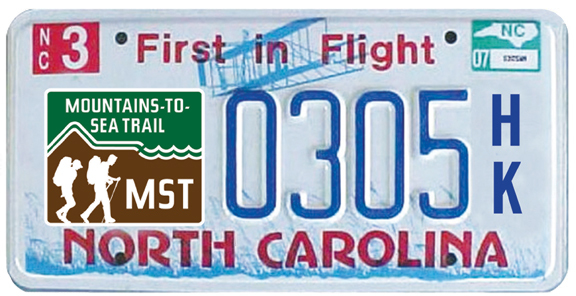 If you’d like your own MST plate, you can order directly from NC DMV. Why buy an MST plate? The plates are a great way to promote awareness of the MST. Personalized plates with your own 4-character message are available. NEW BENEFIT: Anyone who purchases a new MST plate will receive a 1-yr membership in Friends of the MST. If you’re already a member, you can gift this to a friend! Questions? Please contact Betsy Brown, Outreach Manager, at 919-825-0297 x 702 or bbrown@mountainstoseatrail.org.